The Ohio Assessments for Educators (OAE) is a suite of standardized exams meant to measure a candidate’s aptitude and knowledge around the established standard for performance in education. These exams are created in adherence with Ohio educational standards, from the Ohio Educational Preparation Standards to the Ohio Educator and Ohio Student Standards. All OAE exams are computer-based and all include multiple-choice questions, while only some also have constructed-response questions. 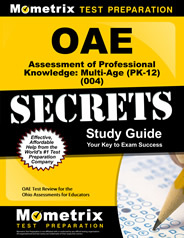 The OAE Assessment for Professional Knowledge: Multi-Age (PK-12) is the exam within this suite targeted at candidates who want to demonstrate their knowledge for educating students in every age range, from preschool until they complete high school. How Can I Register for OAE’s Multi-Age Professional Knowledge? How Is it Administered? Prepare with our OAE Assessment of Professional Knowledge: Multi-Age (PK-12) Study Guide and Practice Questions. Print or eBook. Guaranteed to raise your score. Get started today! To register for the OAE Assessment of Professional Knowledge: Multi-Age, prospective participants should register on the OAE website. Because the exam is administered by Pearson VUE, an international standardized testing company, it is offered at locations throughout Ohio and around the world. Prospective participants can choose the specific testing location and date/time that works best for them. Testing appointments are made on a first-come, first-served basis. Prospective participants will have to pay a $105 fee to register for the exam. The registration fee must be paid through a VISA or MasterCard credit card, debit or check card. Registration is valid for one year following the date of issuance and if prospective participants do not schedule a test appointment and take the test within a year of registering, or they withdraw their registration within a year, that registration will expire and no refund will be provided. What Can I and Can I Not Bring to the Multi-Age Professional Knowledge Exam from OAE? Participants are not allowed to bring calculators with them to the OAE Assessment of Professional Knowledge: Multi-Age. For any questions that might require a calculator, an on-screen option will be provided. Participants are also forbidden from bringing cell phones, music players, handwritten or printed materials included scratch paper and textbooks, backpacks and food and drink, among other items. Participants must bring with them at least one piece of current, government issued identification printed in English, bearing the name in which they registered for the exam, along with their signature and photo. Acceptable forms of identification include driver’s licenses and passports. What Specific Content Is on the OAE Assessment of Professional Knowledge: Multi-Age (PK-12) Exam? OAE Assessment of Professional Knowledge: Multi-Age (PK-12) Flashcards. Proven test flashcards raise your score on the OAE test. Guaranteed. The OAE Assessment of Professional Knowledge: Multi-Age exam is made up of 100 multiple-choice questions and two constructed-response assignments. Participants are given a total of three hours to complete the full exam, plus a 15-minute tutorial to become familiar with the computer-based testing model it utilizes. How Can I Get a Passing Score on the Ohio Assessments for Educators Multi-Age Professional Knowledge Exam? 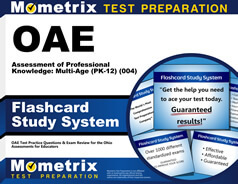 Because the OAE Assessment of Professional Knowledge: Multi-Age exam expects its participants to demonstrate a full breadth of educational standards proficiency, it’s recommended that those preparing to take it spend their study time leveraging a combination of a study guide and a set of study flashcards. The study guide will allow them to gain a working knowledge of all of the material that appears on the exam and the flashcards will serve as a tool for drilling the detailed information in a way that’s demonstrable on the exam itself. Mometrix Test Preparation offers the combination of both such a study guide and set of flashcards perfectly suited for those who are preparing for success on the OAE Assessment of Professional Knowledge: Multi-Age.